OTTAWA – February 28, 2013 – Recycle My Cell, Canada’s national recycling program for mobile phones and accessories, announced today the winners of the third annual Recycle My Cell Student Challenge. Held again in partnership with Waste Reduction Week in Canada, the Challenge saw Canadian students from kindergarten to post-secondary collecting as many old wireless devices as possible, including cell phones, smartphones, wireless PDAs, pagers, accessories and cell phone batteries. The Challenge took place from October 15 to November 15, 2012, with 131 schools across Canada participating. A total of 4,260 cell phones were collected through the Challenge, along with over 270 kilograms of wireless accessories and batteries. Based on student population, the school in the participating province or territory that collected the most cell phones and accessories will receive a $500 donation to support the school’s green initiatives. The Recycle My Cell Student Challenge was made possible by the generous support of the Recycle My Cell Partners: Bell, BlackBerry, Dell Canada Inc, Eastlink, GEEP Inc., GREENTEC, LG Electronics Canada Inc., Lynx Mobility, Mobilicity, Motorola Mobility, MTS, Nokia, Rogers Communications, Samsung Electronics Canada Inc., SaskTel, Sims Recycling Solutions, Sony Mobile Communications, TBayTel, TELUS, Videotron, Virgin Mobile Canada and WIND Mobile. Recycle My Cell thanks all of the schools that participated in the third annual Recycle My Cell Student Challenge. 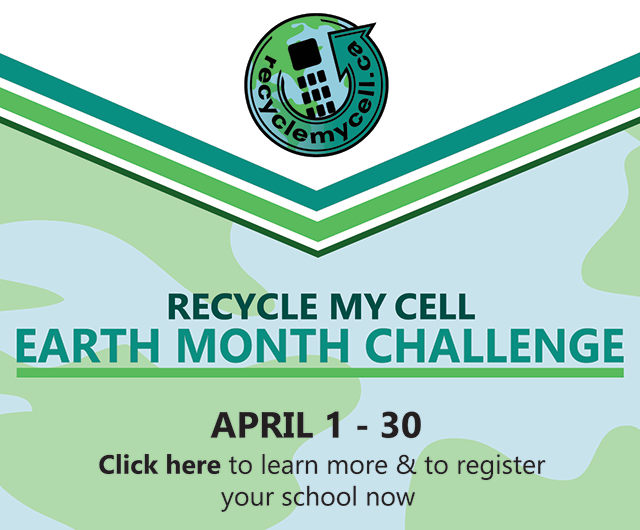 If your school is interested in participating in the next Challenge, please contact info@recyclemycell.ca. Recycle My Cell operates year round, and if you would like to host a Recycle My Cell collection site in your community, please visit https://www.recyclemycell.ca/host-a-drop-off-location. There is no cost to participate, and you will be providing a valuable service to your community by ensuring that e-waste is recycled responsibly.